When one thinks of war, the first words that immediately come to mind are chaos, destruction, and suffering. However, amidst all of the disaster existing during a time of war, love and human connections are still taking place. Affection so deep in fact that it can withstand any amount of years, multiple tribulations and create a legacy that will live on forever by giving life to beautiful children, grandchildren, and many generations to follow. More specifically, it was during WWII that thousands of love stories were unfolding during a period of discord; American soldiers stationed overseas were finding love in places they thought they’d only acquire pain and loss. For Lilly and Don Preston, their love story began in Frankfurt, Germany, and has surpassed decades and continents. To this day, their marriage continues to flourish right here in Texarkana, Texas. Don Preston, a WWII veteran, was born in Texarkana in 1927. After attending Sacred Heart School and learning how to type, he volunteered his time and allegiance to the United States Army. He enlisted into the armed forces when he became 18 years old, leaving behind a well-paying job, in addition to setting aside school. “I went into the service on my 18th birthday. I left school early to go,” recalls the 91-year-old WWII veteran. At the young age of 16, Don worked as a barkeeper at Deluxe Bowling Lane where he recalls earning more than a decent living and making more money than some adults who worked at the arsenal in town. Two years later, while still working as a barkeep, Don enlisted. Almost immediately after signing to the Army, his ability to type landed him a position in communications within the forces. Soon, Don was deployed to Europe where he was stationed in different parts of France until ending up in Frankfurt, Germany, in 1947, where he would work in telecommunications. Little did he know it was inside the four walls of this operation that he would find a beautiful German girl who would later become his wife. 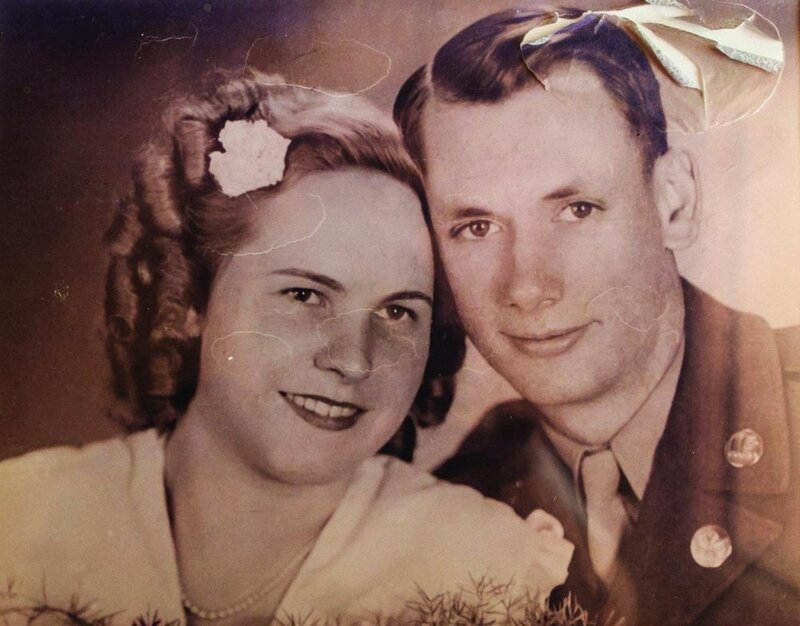 Don and Lilly met in Frankfurt, Germany, in 1947, while he was stationed there in the United States Army. lines by one of Don’s fellow countrymen who also worked in the telecommunications operation. “One of my compatriots phoned me and told me I had a call on Line 1, then he called Lilly and told her that she also had a call on Line 1. He patched us through, and I picked up the phone and said ‘Hello?’ explained Don. “The first thing she said to me was, ‘What do you want?’” declares Don with laughter. Lilly and Don did not know each other besides these few seconds on the telephone. “He found out I was going to have a break in the next 20 minutes, and he asked if I wanted to go have a Coke,” adds Lilly. Lilly’s English was a work in progress at the time, but she knew enough to get by and certainly enough to agree to grab a Coke with the gentleman on the phone. The two shared their first date that night, they interchanged conversation while drinking a couple of Coca-Colas, and soon after that, they could hardly be apart. “We became almost inseparable. We both had bicycles, and we rode them by the woods,” says Don. Their love blossomed amidst an ongoing war, and for two years, Lilly and Don learned about each other and grew in love. As Don’s deployment came to an end, he knew he could not leave his Lilly behind and asked for her hand in marriage. She would have to leave her entire life in Germany and move to Texas with Don, to begin her new life. This meant leaving behind her mother, who she would not see for the next 23 years. This also meant she would have to learn the customs of a new country, learn the English language, and a completely new way of life. “He said to me, ‘I am leaving to go back home to Texas. Will you marry me and come with me? You will be the poorest girl in Texarkana!’ Well, at least he was being honest,” says Lilly with a cheeky smile. Lilly said, “Yes, without a shadow of a doubt” and uprooted her life to be with her American soldier. Don and Lilly with their daughters in 2013 (top row) Carol “Denice” Hollier (youngest) and Donna Lynn Jeffus (next to youngest); and (bottom row) Mary “Madelein” McBride (oldest) and Adine “Evelyn” Pinkner (next to oldest). Once in Texarkana, Lilly and Don began building their life, a few years later filling the rooms of their house with four beautiful daughters. Although the WWII couple lived out their love story every day, life did not fail to throw some unexpected and painful curve balls. The couple’s youngest daughter passed away from breast cancer in 2015, and their home burnt down shortly after in February 2017, causing them to lose many belongings which held great meaning to them. Thankfully, no one in their family was harmed during the fire which began in the attic of their home causing the property to be completely engulfed in less than five minutes. “I’m completely lost about my home being gone,” explains Don. Despite these tough tribulations, Don and Lilly continue to live their life and love one another more than ever. Spending time with family is very important to Don and Lilly. Here, they all enjoyed a family reunion in Hot Springs, Arkansas. Pictured are: (front row) Marianne McBride (granddaughter) holding Maddie McBride (great- granddaughter), Amber Runion (granddaughter), Lilly Preston holding Alayna Runion (great-granddaughter), Don Preston holding Adelynn Runion (great-granddaughter), and Amanda Buffington (granddaughter); (middle row, sitting on couch in green shirt) Tucker Runion (great-grandson); (back row) Danny Runion (grandson), Glenn McBride (son-in-law), Madelein McBride (daughter), Donna Jeffus (daughter), Jason McBride (grandson), and Christina Harrod (friend). Despite meeting during a time of war, and experiencing extremely trying experiences throughout their lives, they continue to support and love each other through it all. “We hold hands every night when we go to sleep just in case someone wants to run off,” says Lilly as she squeezes Don’s hand. This love story has surpassed language barriers, continents, the test of time, and continues to thrive, so much in fact that it has set an example to their children, grandchildren, and great-grandchildren. “They’ve always been an exemplary couple. They kiss and hug all the time. They really are the perfect role models. They truly love each other and have for 70 years,” says granddaughter, Amber Runion, along with daughters, Evelyn Pinkner and Donna Jeffus. The Prestons watch football together, enjoy seeing their seven grandchildren and five great-grandchildren grow, and even continue to entertain family and friends inside their home. “They have always included everyone. They love having us over, not just on holidays,” adds Amber. Don and Lilly’s love can be felt just by being in their presence. They sit closely next to each other, holding hands, as they recall the years they spent in Germany and all of the decades after that. Their voices fill with emotion and laughter as they remember all of the memories they’ve made. “I never got in trouble in the Army or in life, except when I met this girl,” jokes Don as he looks at his bride. Despite the turmoil of war, a beautiful bond emerged: a captivating love story between an American soldier and a German girl which will live on for eternity. “I hate war,” Don says fighting back tears. “We truly don’t know how lucky we are, but here we are,” concludes 88-year-old Lilly.